I know that vegetarian sausage is not something you may typically see on a salad, but recently I have been trying to incorporate more protein and less dairy into my diet, which as a vegetarian is pretty hard as without meat, fish and cheese, there is not always much else left! Eggs are a fantastic source of protein, as are vegetarian protein replacements and so my go-to lunch of late has consisted of a salad with Quorn Sausages. For this meal, I did add a bit of sour cream to my salad, but if you want to avoid dairy altogether, you could add balsamic glaze instead. You could also replace the sausage with perhaps the quorn ham/chicken too. I hope you enjoy making this salad. What is your favourite salad? 1. 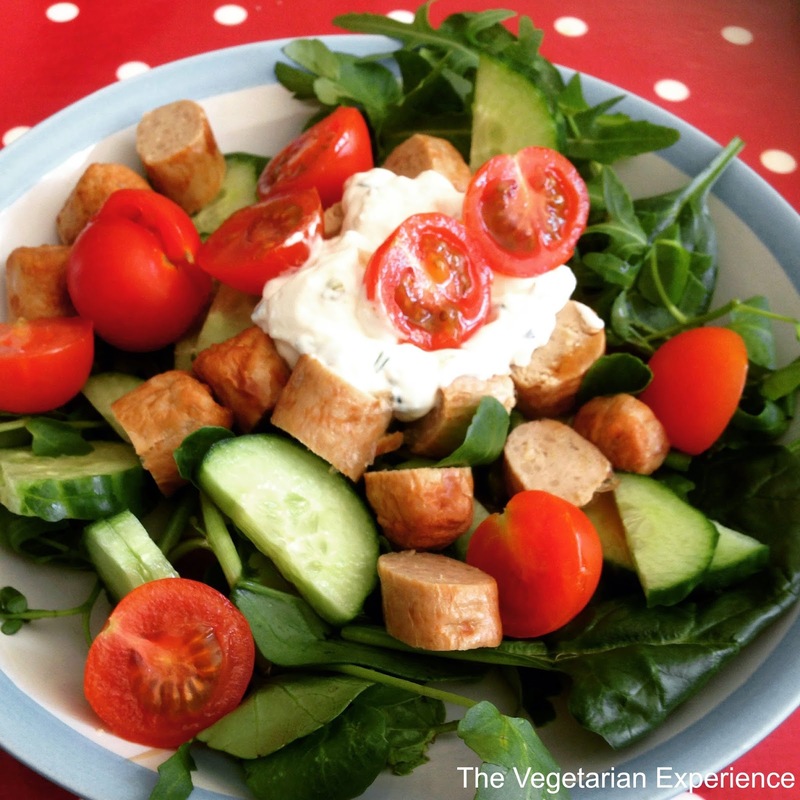 Assemble the salad by placing the salad leaves in a dish first, followed by sprinkling the tomatoes, cucumber and Quorn sausage over the top. 2. Add the dressing - either 2 tsps Sour Cream and Chive dip, or balsamic dressing.